Aims: To investigate the effects of sire genetics, nutrition, level of supplementation, gender and their interactions on wool comfort factor (CF) and its correlation with other wool quality traits in crossbred sheep either grazing or supplemented with dietary protein. Study design: A 5 x 2 x 2 x 2 factorial experimental design comprising five sire breeds, two dietary protein sources, two supplementation levels and two sexes respectively, was utilized. Place and Duration of Study: University of Tasmania Farm, Cambridge, Hobart, Tasmania, Australia, between April 2008 and November 2010. Methodology: Texel, Coopworth, White Suffolk, East-Friesian and Dorset sires were joined with 500 Merino ewes at a mating ratio of 1:100 in individual paddocks. Five hundred of the crossbred progeny were raised on pastures until weaning at 12 weeks of age. Forty of the weaners with an initial body weight (BW) range of 23-31 kg (average of 27 ± 3.2 kg) were fed with lupins or canola at 1 or 2% BW for 6 weeks in individual metabolic crates. CF and other wool quality traits were commercially measured at the Australian Wool Testing Authority, Melbourne. The data were analyzed in SAS using MIXED model procedures with sire fitted as a random effect, while sire breed, nutrition, supplement, level of supplementation and gender and their interactions were fitted as fixed effects. Results: CF was significantly correlated with fiber diameter (-0.89), spinning fineness (-0.95) and wool curvature (0.33). 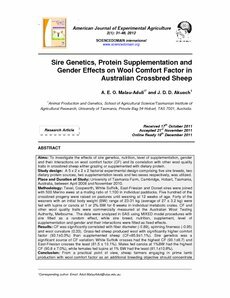 Grass-fed sheep produced wool with significantly higher comfort factor (93.1±0.3%) than supplemented sheep (CF=85.9±1.1%). Sire genetics was a significant source of CF variation; White Suffolk crosses had the highest CF (90.1±8.7) and East-Friesian crosses the least (81.5 ± 10.1%). Males fed canola at 1%BW had the highest CF (90.8 ± 7.0%), while females fed lupins at 1% BW had the least (81.1±10.8%). Conclusion: From a practical point of view, sheep farmers engaging in prime lamb production with wool comfort factor as an additional breeding objective should concentrate their effort on grass-feeding White Suffolk x Merino wethers. During the winter feed gap, supplementing the wethers with canola at 1% BW will not compromise wool CF.